Upper and lower epidermis lacking a cuticle. All of the guard cells occur in the upper epidermis. Why ? The lower epidermis also contains many small mucilage secreting cells. Mesophyll. Most of the ground tissue of this leaf is highly lacunose, that is, it has a large volume of intercellular space. The most compact mesophyll tissue is the palisade, which consists of 2-3 layers of cells and comprises only about a quarter of the total thickness of the leaf. The spongy tissue is made up mostly of chains of parenchyma cells which form a network enclosing the large intercellular spaces. Note that where the chains meet, the parenchyma cells are branched. 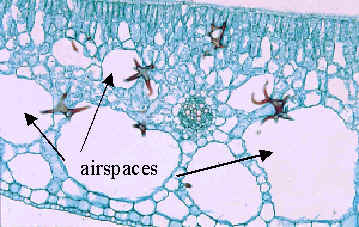 lso note that the large branched sclereids (trichosclereids), with arms and processes extending into the air chambers of the mesophyll. Small angular crystals are embedded in the walls of the sclereids. Vascular tissue. In the region of the veins, the spongy parenchyma cells form a compact tissue and sheath around the vascular tissues.